Government Of The Punjab Services and General Administration Department has just announced Holiday Notification Kashmir Solidarity Day 5th February 2019. 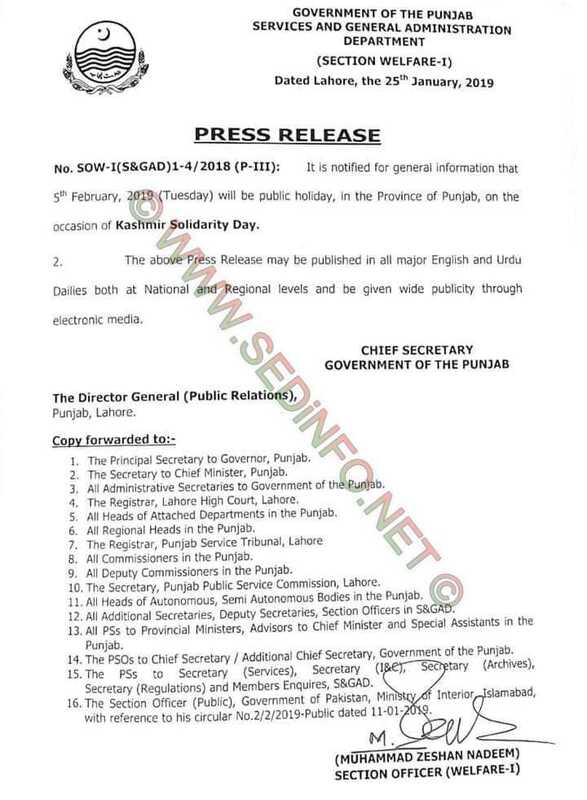 According to notification: It is notified for general information that 5th February, 2019 (Tuesday) will be public holiday, in the Province of Punjab, on the occasion of Kashmir Solidarity Day. The above Press Release may be published in all major English and Urdu Dailies at National and Regional levels and be given wide publicity through electronic media. For more details, look into following attached copy of the notification. Get latest and updated notifications and policies from Government of Punjab. We deliver as it happens, so never ever forget to check all these latest news updates.